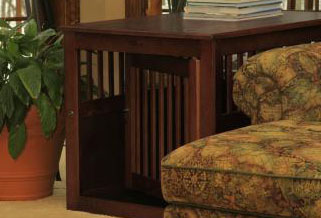 Dog Crates for home and travel. Dog Bed Works has an extensive selection for your needs. From wooden furniture style crates to portable dog crates for your car, we'll have something for you. Always the best with style, function and safety in mind for you and your pet. For Dogs Up to 50 Lbs. For Dogs Up To 70 Lbs. For Dogs Up To 90 Lbs.